Aside from the bright leaves of maple trees and pumpkins ripening on the vine, not many things show the signs of fall more than apples. So significant to Wisconsin's agricultural heritage, apple season is celebrated across the state. This weekend the Bayfield Apple Festival celebrates its 57th year of celebrating the ever-popular fruit. "It's ... quite a tradition, a lot of families used to come with their kids and now they're bringing their kids, so it is steeped in tradition for sure," said Jim Hauser, owner and operator of Hauser’s Superior View Farm in Bayfield. And with winter right around the corner, many families see the festival as one of the last opportunities to celebrate the outdoors and the harvest bounty, said Dane Hauser, Jim Hauser’s son and Apfelhaus Hard Cidery Manager on Hauser’s Superior View Farm. "They're getting out there, they're enjoying the weather, enjoying the farms, enjoying all different sorts of apple products ... I think people are just trying to have fun before we get the snow," he said. Ranked as one of the 10 Best Fall Harvest Festivals in the nation, nearly 50,000 visitors descend on the tiny town of Bayfield looking for a range of apples to try, from the most popular variety Honeycrisp, to a variety unique to an orchard, like the Hauser’s Merlot from the Hauser family orchard. Over 60 orchard and food booths in downtown Bayfield sell apples and apple-related products, from caramel apples to hard apple cider. Arts, crafts and vender booths, along with an apple peeling contest, fish fry, music and dancing accompany the apples over the weekend, rounding it all out with a parade Sunday. Visitors can also venture to the local farms and orchards. 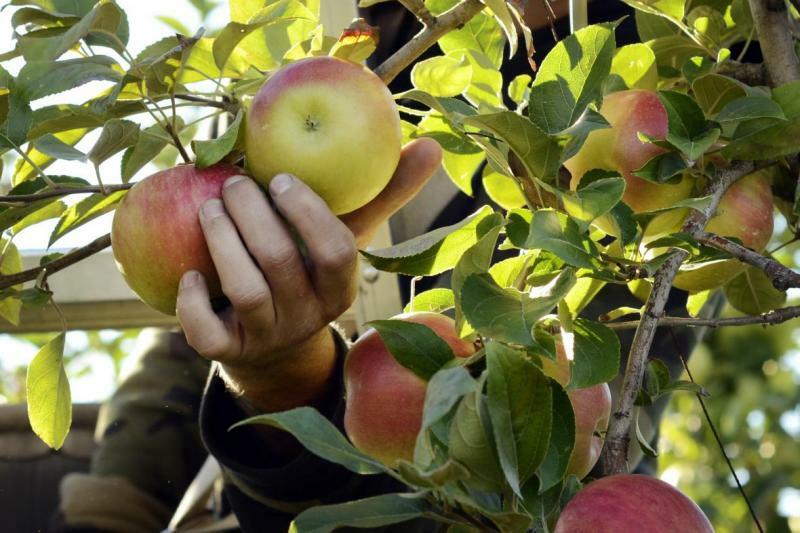 The Hauser’s farm is one of eight apple orchards in Bayfield and it’s been in the family since 1908, They still pick apples from some trees that have been on the farm for more than 100 years, Jim Hauser said. Over the years the farm has come up with a variety of ways to use and sell their apples — they recently launched Apfelhaus Hard Cidery, Dane Hauser said. "It's just like the ... microbrew craze," he said. "So the cider craze ... has been starting I’d say the last six, eight, 10 years, but it's getting more popular," he said. Apples aren’t the only crop the Bayfield peninsula is known for, its soil and climate is also good for berries and flowers, Jim Hauser said. "The big body of water that we have … delays our spring a little bit," he said. "Then the fall ... it delays when we get our first hard frost or killing frost, it extends the season a little bit longer." This year’s apple crop isn’t quite as big as last year’s, but Jim Hauser said that’s common for a crop following a big year. "We have plenty of apples for everybody at Apple Fest that's for sure," he said.